Vitamin A&D GRX® is a first aid healing ointment that protects and revitalizes chafed, chapped and cracked skin areas. It contains both petrolatum and lanolin ingredients to help seal moisture into the skin. The ointment also contains vitamins A and D to help speed up the wound-healing process. 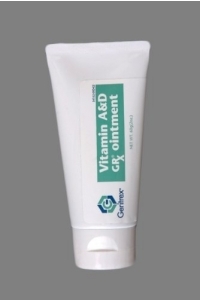 Vitamin A&D GRX® ointment can be applied to minor skin injuries including cuts, scrapes, rashes and burns. Apply liberally as often as necessary. Change wet and soiled diapers promptly, cleanse the diaper area, and allow to dry. Use with each diaper change, especially at bedtime when exposure to wet diapers may be prolonged. Active Ingredient: Petrolatum (53.4%), Lanolin (15.5%). Inactive Ingredients: Cod Liver Oil (Contains Vitamin A & Vitamin D), Fragrance, Light Mineral Oil, Microcrystalline Wax, Paraffin.